After more than 10 years of experience, moving to an electronic trauma flow sheet is still not ready for prime time. I’ve seen many, many hospitals struggling to make it work. And all but a very few have failed. There are two major problems. First, existing computer input technology is underdeveloped. Trying to rapidly put information into small windows on a computer, and having to switch between mouse and keyboard and back is just too slow. And second, output reports are terrible. Humans cannot scan 26 pages of chronological data and reconstruct a trauma activation in their head. There is so much extra data in the typical computer-generated reports, the signal (potential PI issues) gets lost in the noise. The technology exists to remedy both of the problems. However, the EHR vendors keep tight control over data exchange in and out of their products. Sure, there is CareAnywhere and it’s ilk, but the user is still forced to use the vendor’s flawed input and output systems. Bottom line: You can’t make a complex system (trauma care) easier or safer by adding complexity (the EHR). Yet. The electronic trauma flow sheet will never work as well as it could until all the vendors settle on a strong data interchange standard to put data into and get reports out of the EHR. Once that happens, scores of startup companies will start to design easy input systems and report outputs or displays that are actually meaningful. There’s not enough interest in this niche market to make it worthwhile for a company the size of Epic or McKesson, but there is definitely enough for a lot of young companies just chomping at the bit in Silicon Valley. I started voicing my concerns about trying to use an electronic trauma flow sheet (eTFS) way back in 2008. There are very few reports in the literature that specifically detail using the EHR as a trauma flow sheet. The first (see reference 1 below) described an early experience with the conversion process. It outlines lessons learned during one center’s experience, and I’ve not seen any published followup from that center. electronic scribe, and had to be present at every trauma resuscitation. The goal of the study was to compare completion rates between paper and electronic documentation. One year of experience with each was collected. Yes. That’s it. They looked at 11 data points. It says nothing about the wealth of other information that has to be recorded and needs to be abstracted or analyzed. And nothing about the reports generated and their utility. Or how much additional time must be spent by the trauma PI program to figure out what really happened. Or how good their paper documentation was in the first place (not so good, apparently). Or the bias of knowing that your documentation under Epic is being scrutinized for the study. And to get to that level, this hospital had to maintain a complement of highly trained nurses who were facile with their customized Epic trauma narrator. And they had to maintain their skills despite seeing only one highest level trauma activation patient per week, or one activation at any level only every other day. I’ve had a few discussions with the trauma program manager from this hospital, and I am convinced that they have managed to make it work well at their center. However, I’m not certain that their system can be generalized to hospitals with higher volumes and and degree of staffing restraints. In my final post of this series, I’ll tell you what I really think about using the electronic trauma flow sheet in your trauma resuscitations, and why. Using the electronic medical record for trauma resuscitations: is it possible? J Emerg Nursing 36(4):381-384, 2010. A comparison of paper documentation to electronic documentation for trauma resuscitations at a Level I pediatric trauma center. J Emerg Nursing 41(1):52-56, 2015. The EHR has been around longer than you think. Even before the current desktop style microcomputers existed, a few hospitals implemented early versions of this product. One of the first was the Latter Day Saints Hospital in Salt Lake City. It installed what it called the HELP system, an acronym for Health Evaluation through Logical Programming. As computing power increased and the size of the computer box and its cost decreased, a series of advances in medical software systems began to occur. In 1983, a software product geared toward resource scheduling was introduced, and became one of the leading applications of its kind. Most people recognize the name Cadence, but few realize that this was one of the earliest product releases from Epic Systems Corporation. In 1988, the US government contracted out to develop an electronic record system for the military, much of which is still in use today. On a smaller scale, PC type computers were almost 10 years old in 1990 when Microsoft introduced what I consider the first real version of Windows, version 3.0. Epic was once again an innovator, and it released a product called EpicCare for Windows. Beginning in 2004, there was a move within the government to emphasize implementation of EHRs across the US, spearheaded by President George W. Bush. And as expected, this led to a number of products developed by a variety of software makers. 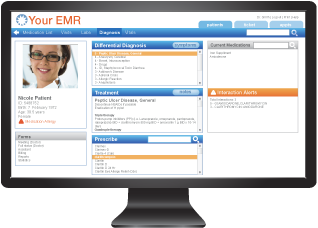 The push to roll out an EHR universally continues to this day, with no end in sight. Is this a good thing or a bad one? Although much maligned, the EHR can certainly offer benefits. However, like anything touted as a miracle drug or device, there are always downsides. I’ll review both over the course of the week, but my focus will be on one very specific trauma problem: use of the EHR during trauma resuscitation. Many trauma programs either voluntarily adopted the use of an electronic trauma flow sheet (eTFS), or were forced into it by their hospital administration or IT department. Good idea or not? I’m going to dedicate this week to discussing the impact of the electronic health record (EHR) on trauma care. First, I’ll talk a little about the history of the EHR, how it came about and why it was “encouraged” of all hospitals. I’ll also look at who the big players are. Next, I’ll review two studies of the impact of the EHR on ED productivity and patient stay. And finally, I’ll really dig into using an electronic trauma flow sheet that interfaces with the EHR. My thinking has slowly been changing, but not by much. I’ll review my reasons, and talk about the (few) success stories that are out there.